Pedestrians are vulnerable in traffic. Children and people older than 75 in particular, have a high casualty rate. A relatively large number of crashes involving older people occur close to pedestrian crossings. Cars are the most frequent crash opponents in crashes with pedestrians. Infrastructural measures (such as the construction of 30 km/h zones and safe pedestrian crossings), vehicle measures (such as pedestrian-friendly car fronts and the implementation of speed-limiting devices), and behavioural measures (such as improving information and education), can increase the road safety of pedestrians. Pedestrians are a vulnerable group of road users (see the archived SWOV Fact sheet Vulnerable road users). This Fact sheet discusses road safety of various groups of pedestrians, the causes of their risks and measures to improve pedestrian safety. How many pedestrian casualties are there? 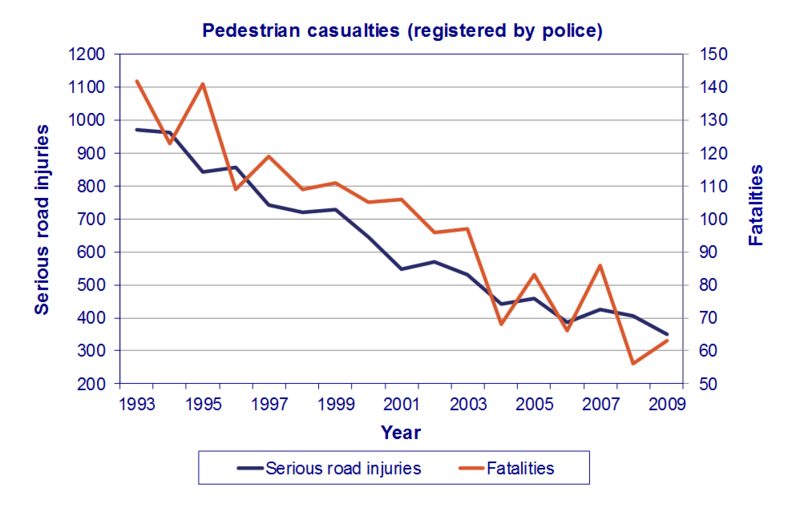 Figure 1 shows the number of registered serious road injuries and road fatalities among pedestrians during the period 1994-2009 in the Netherlands. According to the definition of a road crash, only casualties in pedestrian crashes involving a moving vehicle are included. Figure 1. Source: Ministry of Infrastructure and the Environment – BRON. Since 1993, the number of registered serious casualties among pedestrians (fatalities and serious road injuries) has decreased by more than 63%, to approximately 350 serious road injuries in 2009. However, we must bear in mind that the registration rate of road casualties among pedestrians is low. In 2009, this figure was 81% for seriously injured pedestrians (crashes involving motor vehicles) and 49% (crashes involving any other road user), and 93% for fatalities. Therefore, real numbers are considerably higher for casualties among pedestrians. The actual trend may also differ from the one shown in Figure 1 because the registration rate varies and is decreasing still. The decrease of 63% since 1993 is approximately equal to the decrease of serious crashes among car passengers, but much greater than the decrease among casualties of bicycle crashes, which is 44%. Figure 1 also shows that there was no question of a continuous decrease in the number of casualties; instead, variation can be found. Given the relatively few numbers and abovementioned variation in registration rate, the variation in the number of casualties is not great enough to regard it as considerable deviation from the trend. How high is the pedestrian casualty rate? By pedestrian casualty rate, we mean the number of casualties per distance travelled. In order to determine the casualty rate amongst pedestrians, exposure data is required that accurately reflects the movements of pedestrians. The Netherlands Mobility Survey (MON) gathers information on kilometres travelled by individuals with various means of transport, including ‘walking’. This data shows that in the Netherlands pedestrians cover approximately 3.8 billion kilometres per year. The casualty rate when walking is approximately equal to the casualty rate of cyclists, but it is maximally twice as high as the casualty rate of driving (Hakkert, 2010). Figure 2 shows the pedestrian casualty rate according to age group. It indicates that pedestrians aged 75 and over have the highest casualty rate due to a serious road crash. Compared to the large middle group aged 20-74, children as pedestrians also have a higher casualty rate. Developments in pedestrian casualty rates over time are not continuously rising or falling, in the last ten years, however, there has been a decreasing trend for most age groups. Figure 2. The number of registered serious road injuries and road crash fatalities per billion kilometres travelled (casualty rate) among pedestrians. Sources: Ministry of Infrastructure and the Environment - BRON and CBS/DVS - MON. Where do pedestrian casualties occur and who are the crash opponents? If we look at the average over the period 2007-2009, 86% of the pedestrian casualties in the Netherlands occurred in urban areas. 58% of the road deaths occurred on 50 km/h roads, 13% on 80 km/h roads, 6% on 30 km/h roads, and 6% on 60 km/h roads. For serious road injuries these percentages are: 65% on 50, 20% on 30, 4% on 80 en 3% on 60 km/h roads. Proportionally, many casualties occurred at pedestrian crossings (see the archived SWOV Fact sheet Crossing facilities for cyclists and pedestrians). On average during the period 2007-2009, cars were the most frequent crash opponents of pedestrians, namely for almost 67% of the in-patients. For approximately 11% of the in-patients a delivery van or lorry was the crash opponent; for 8% it was a moped rider and for 8% a light moped rider or cyclist. If we consider the fatally injured pedestrians, the share of vans and lorries is somewhat higher (20%), and that of cars is somewhat lower (57%). 14% of the pedestrian road deaths crashed with an ‘other vehicle’, mainly agricultural vehicles, trains and trams. Research shows that the outcome of crashes with motorized vehicles is mainly determined by the collision speed. This is illustrated in Figure 3 which shows that the probability of a crash being fatal rapidly increases with collision speeds above approximately 30 km/h (Rosén et al., 2011). Figure 3. 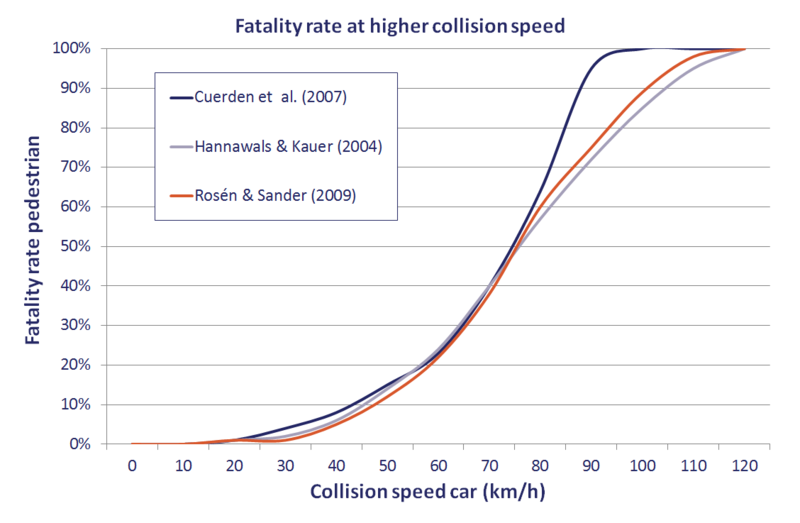 The link between the probability of death and the collision speed of pedestrian/car front crashes, as found in some recent studies (in: Rosén et al., 2011). What causes the high pedestrian casualty risk? Walking is an important form of mobility for everyone, particularly for the young and the elderly. It is a mode of transport where people are unprotected and move at low speed and mass. This makes pedestrians vulnerable, so that collisions with other types of road users often have serious consequences for the pedestrians (Wegman & Aarts, 2006; Methorst et al., 2010). Children are not small adults. They must literally learn step by step; they are also not able to apply everything they learn immediately or faultlessly. This is also the case in traffic. This is due to the physical and mental (cognitive) development process that children undergo whilst maturing into adults (Rijk, 2008). It is also evident that the skills of young children in particular, which are important for crossing roads safely, are still insufficiently developed, such as observation skills, perception of dangerous locations, and information processing (Dragutinovic & Twisk, 2006). Not until the age of eleven are children fully able to select the information needed to carry out the task of crossing the road. The archived SWOV Fact sheet Road safety of children in the Netherlands shows that children as pedestrians, are less of a road safety problem than children as cyclists. Davidse (2007) shows that the most important cause of the high risk of elderly pedestrians is their greater physical vulnerability (see also the SWOV Fact sheet The elderly in traffic). Functional limitations can also influence their road safety. For example, when crossing the road the following factors are important: elderly pedestrians tend to walk slower than the young, they have a longer start-up time, they are less capable of detecting approaching vehicles and estimating their speed, and they notice vehicles approaching from the side less quickly due to their more limited peripheral vision and less flexible neck movement, plus the fact that, due to slower reaction time and motor skill dysfunction, they can evade their crash opponent less quickly. What traffic engineering and infrastructural measures can improve pedestrian safety? In view of the relation between collision speed and the probability of a crash being fatal (Figure 3), any reduction of collision speed will greatly reduce that probability. Crashes with collision speeds below 30 km/h usually end well. One of the Sustainable Safety principles has therefore been derived from this fact: at locations where pedestrians and fast traffic encounter each other, the driving speed of fast traffic must be reduced to 30 km/h. As long as no Intelligent Speed Assistance (ISA) measures can be taken, speed reduction will mainly have to be enforced via traffic engineering and infrastructural measures (see SWOV Fact sheet Speed and speed management). The safety of pedestrians is also an issue at crossings. Here also, something extra will need to be done, such as the construction of highly visible, recognizable and uniform crossings. Raised crossings (plateaus) ensure that drivers can only traverse them at low speed. There are a number of initiatives to make school routes and other well-used routes safer for young pedestrians (see for example Rijk, 2008). This can for instance be achieved by setting up so-called ‘kid routes’. Kid routes are special corridors for guiding children to schools, playgrounds and sports facilities via safe routes. These kid routes are constructed particularly in busy communities. Delft and Amsterdam are the first municipalities in the Netherlands where, since 2006, children have been able to use the kid routes. The special child-friendly routes are designed in a playful way, with recognizable signs and road markings that lead the children to their destination (De Jager et al., 2006). Observation of behaviour (differences in speed and conflicts) by the Dutch Fietsberaad (Godefrooij et al., 2005) and the German FGSV (2010) shows that cycling in pedestrian areas is safe and possible as long as the number of pedestrians is no higher than 100 per hour per metre of profile width. A ‘divided profile’ (with a separate driving strip for cyclists) is advised at a number of 100 – 200 pedestrians per hour per metre of profile width, and at a number of more than 200 pedestrians a shared use of the area is advised against. No critical limit for the number of cyclists was established, although in reality their number is not higher than 600 cyclists per hour. What vehicle measures can improve pedestrian safety? A pedestrian-friendly car front is a front construction from which sharp and hard/stiff parts have been removed, so that if a pedestrian collides with a car there is as little (serious) injury as possible. Not until 1995 did research carried out into the protection of pedestrians over a period of decades result in European requirements for passenger vehicles (EU, 2003). The first phase of the measures involved was introduced from 2005 for new vehicle models. This concerned the less stringent ones. The second phase, concerning the more stringent measures, has come into force for new vehicle models from 2010. From 2012 and 2015 respectively, the less and the more stringent measures must be applied to all new vehicles, including the older models. Opinions are divided regarding the effectiveness of the measure. The European Transport Safety Council ETSC anticipates large reductions in casualties (ETSC, 2001). It must be noted that the application of pedestrian-friendly car fronts assumes that the earlier mentioned (collision) speed limit of approximately 30 km/h is not exceeded. Volvo and Mercedes Benz have chosen a different approach. An approaching pedestrian is detected by a radar system and a camera in the vehicle. The vehicle sends out a warning to the driver and subsequently starts to brake automatically. Since 1 January 1995, all new lorries, trailers and semi-trailers must be fitted with side underrun protection. For pedestrians amongst others, closed side underrun protection on lorries is more effective in reducing the seriousness of injuries than open side underrun protection. Both open and closed side underrun protection are in the top ten measures for lorries that score well in cost effectiveness (Van Kampen & Schoon, 1999). Speed reduction is possible via speed-limiting devices. In urban areas in particular, Intelligent Speed Assistance (ISA), can contribute effectively by limiting the speed of fast traffic to 30 km/h. However, it is anticipated that ISA will not be introduced quickly, but that this will still take many years (see the archived SWOV Fact sheet Intelligent Speed Assistance (ISA)). What behavioural measures can improve pedestrian road safety? As the car is the pedestrian’s most frequent crash opponent, it is worthwhile educating learner drivers and ensuring that they learn safe behaviour during their driver training. Police enforcement is important to increase drivers’ compliance with the traffic regulations, particularly at pedestrian crossings. In the Netherlands, school crossing patrol officers help children cross the road on their way to and from school. It is compulsory for drivers to stop for the stop signal of a school crossing patrol officer. Wegman & Aarts (2006) recommend keeping the expertise regarding traffic education accessible and to guarantee it by means of, for instance, a traffic education expertise centre. They also point out that, besides this formal training, parents and carers can also contribute to their children’s traffic education. Nowadays this type of informal education plays a very subordinate role (Hoekstra & Mesken, 2010). Pedestrians represent a vulnerable group in traffic. Children and people over 75 are especially at risk. There are many measures concerning infrastructure, vehicles and behaviour that can improve the road safety of pedestrians. Measures that relate to the problems of elderly pedestrians are concerned with infrastructure; measures for younger pedestrians are primarily behavioural. Davidse, R.J. (2007). Assisting the older driver: intersection design and in-car devices to improve the safety of the older driver. Proefschrift Rijksuniversiteit Groningen RUG. SWOV-Dissertatiereeks. SWOV, Leidschendam. Dragutinovic, N. & Twisk, D.A.M. (2006). The effectiveness of road safety education: a literature review. R-2006-6. SWOV, Leidschendam. ETSC (2001). Priorities for EU motor vehicle safety design. European Transport Safety Council ETSC, Brussels. EU (2003). Richtlijn 2003/102/EG van het Europees Parlement en de Raad, van 17 november 2003, betreffende de bescherming van voetgangers en andere kwetsbare weggebruikers voor en bij een botsing met een motorvoertuig en houdende wijziging van Richtlijn 70/156/EEG van de Raad. In: Publicatieblad van de Europese Unie, 6 december 2003; L 321. FGSV (2010). Empfehlungen für Radverkehrsanlagen ERA. Forschungsgesellschaft für Straßen- und Verkehrswesen FGSV, Köln. Godefrooij, H., Hal, E. van & Temme, R. (2005). Fietsers in voetgangersgebieden; Feiten en richtlijnen. Publicatie nummer 8. Fietsberaad, Ede. Hakkert, A.S. (2010). Pedestrian risk and risk factors. In: Methorst R. et al. (eds. ), Pedestrians' quality needs. Final Report of the COST project 358. Walk21, Cheltenham. Hoekstra, A.T.G. & Mesken, J. (2010). De rol van ouders bij informele verkeerseducatie; Vragenlijststudie naar kennis, behoeften en motieven van ouders. R-2010-31. SWOV, Leidschendam. Jager, D. de, Torenstra, J., Haas, J. de & Spapé, I. (2006). Veilige kindcorridor in steden; Kindlint zet dit jaar eerste stapjes in Amsterdam en Delft. In: Verkeerskunde, vol. 57, nr. 4, p. 34-39. Kampen, L.T.B. van & Schoon, C.C. (1999). De veiligheid van vrachtauto's; Een ongevals- en maatregelenanalyse in opdracht van Transport en Logistiek Nederland. R-99-31. SWOV, Leidschendam. Methorst R., Monterde i Bort H., Risser R., Sauter D., et al. (eds.) (2010). Pedestrians' quality needs; Final Report of the COST project 358. Walk21, Cheltenham. Rosén, E., Stigson, H. & Sander, U. (2011). Literature review of pedestrian fatality risk as a function of car impact speed. In: Accident Analysis and Prevention, vol. 43, nr. 1, p. 25-33. Rijk, A. (2008). Verkeersveiligheid van kinderen: een ongevallenanalyse en literatuurstudie. R-2008-6. SWOV, Leidschendam. SWOV (2012). Pedestrian safety. SWOV Fact sheet, January 2012. SWOV, Leidschendam.